Kettle And Fire Bone Broth is a California-based organic meal delivery service that specializes in hearty and comforting bone broths and soups. It partners with renowned food scientists and top chefs to create unique and unforgettable slow-simmered goodness. 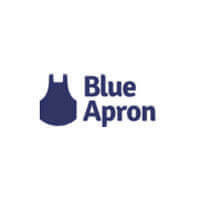 The service has only been around since 2016, but it has already gained numerous loyal customers who love its all-natural soups and broths, as evidenced by more than 1,500 positive customer reviews on its official website. We were curious to find out what it is that keeps the company’s customers coming back for more. Read all about our findings in this honest Kettle And Fire Bone Broth review. Kettle And Fire Bone Broth is a lovely little online shop that exclusively sells bone broths and soups. It only has 3 kinds of bone broth and 3 kinds of soup in its offer. Therefore, you can easily try out all the company’s products, discover your favorites, and enjoy them whenever you are craving something healthy and soul-warming. Ordering from Kettle And Fire Bone Broth is perfectly easy. First, you should decide whether you want to subscribe and save cash or opt for a one-time order. With one-time orders, you simply choose the soups and broths you like, decide on the quantity for each item, choose the one-time purchase option for all products, add them to your cart, and proceed to checkout. If you want to subscribe, the process is equally quick and simple. You choose the soups and/or bone broths you want to receive in your deliveries, decide how many cartons of each soup or broth you want to get, choose the subscribe & save option for each product, and decide on the frequency of your deliveries. You can have your broths and soups delivered every 30, 60 or 90 days. You can modify your subscription at any time by changing the quantity for each item or changing the items in your orders. Furthermore, you can add a new product to your subscription, skip a delivery or cancel your subscription whenever you wish. Whether you are ordering just once or creating a subscription that suits your needs, you can order as many items as you like as there is no minimum order. A single order can include both items you want to receive just once and items in your subscription. Kettle And Fire Bone Broth is one of the rare meal delivery services that exclusively focus on soups and bone broths. However, this is not the only characteristic that sets it apart from the rest of the lot. Kettle And Fire Bone Broth only uses 100% grass-fed bones and organic, all-natural ingredients. 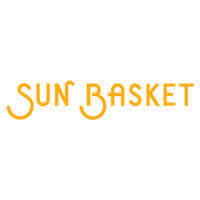 Its products contain no artificial ingredients, extra sodium, antibiotics, hormones, additives or preservatives. All of its broths are simmered for 20 to 24 hours in order to ensure that all the valuable nutrients, amino acids, and collagen end up in the broth. That is why they contain 19 times more collagen than the closest competitor. These nutrient-packed, collagen-rich liquids are used to make the company’s comforting soups. What also makes Kettle And Fire Bone Broth products unique is their long shelf life. They can sit in your kitchen cupboard for up to 2 years in spite of the fact that they contain no preservatives. Finally, it is important to note than Kettle And Fire Bone Broth allows you to save cash on your orders in more than one way. First, you can subscribe and get your soups and broths at up to 33% lower prices. Second, you can purchase value bundles that allow you to save cash in comparison to purchasing individual cartons. Third, you can refer a friend, so your friend gets a 20% discount and you get a $10 credit you can use for future purchases. If you are an active military member or a veteran, be sure to reach out to customer support to get your military discount. As stated previously in this Kettle And Fire Bone Broth review, there are only 6 products on the menu. You can purchase beef bone broth, chicken bone broth, mushroom chicken bone broth, tomato soup, butternut squash soup or miso soup. All soups are made with chicken bone broth. No matter which soup or broth you choose, you can be sure that it is organic and free from gluten, GMOs, dairy, and soy. Not only that, but all the soups and broths are also Paleo-friendly, keto-friendly, and Whole30 approved, so virtually anyone can enjoy them, apart from individuals on meat-free diets. Kettle And Fire Bone Broth creates its recipes in cooperation with world-famous culinary experts, so perfect flavor and texture are guaranteed. While the soups and broths are slow-simmered and take a whole day to make, you can enjoy them in mere minutes. You can simmer them in a pot for 5 minutes or pour into a mug and microwave them for a single minute. The company’s bone broths and soups come in 2-serving cartons. Bone broths and miso soup come in 16.2 oz. cartons while tomato soup and butternut squash soup come in 16.9 oz. cartons. You can decide between individual cartons and bundles. The bundles come in two versions – bundles including only one kind of soup or broth and variety bundles. The bundles can include between 3 and 18 cartons. With Kettle And Fire Bone Broth, the price of your soups and broths depends on two main factors – whether you are a subscriber or not and whether you are purchasing individual cartons or bundles. Here is a complete overview of Kettle And Fire Bone Broth pricing. Beef, chicken, and mushroom chicken bone broths cost $7.99 per carton with one-time purchases and $6.99 with a subscription. Butternut squash, tomato, and miso soups cost $9.99 per carton with one-time purchases and $7.99 with a subscription. Therefore, you get to save 22% on individual cartons if you opt for a subscription. Bundles are even more affordable. You can purchase 12-carton bundles of beef, chicken, and mushroom chicken bone broth for $90 per bundle with one-time purchases and $78 with a subscription. Butternut squash, tomato, and miso soup bundles including 12 cartons cost $107.88 per bundle with one-time purchases and $90 with a subscription. 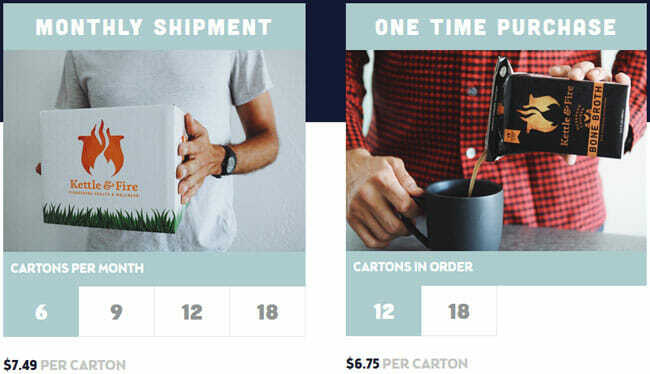 With 12-carton bundles, you save 28% per order if you subscribe. If you opt for 18-carton bundles, the price you pay per bone broth bundle is $125.82 with one-time purchases and $108.21 with a subscription. The price of an 18-carton soup bundle is $143.82 with one-time purchases and $125.82 with a subscription. Thus, you get to save 33% if you subscribe. Finally, you can choose the variety bundles. 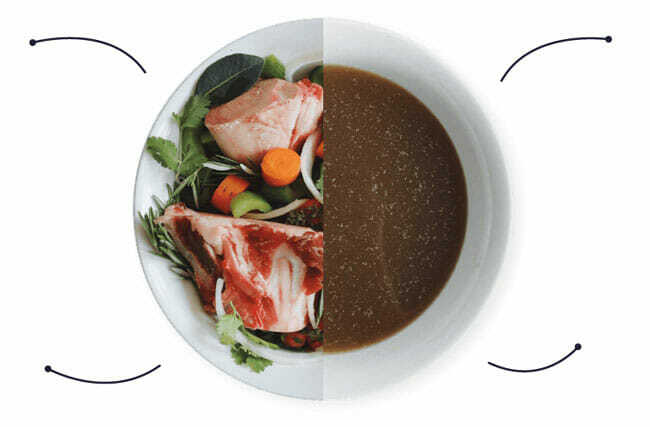 The bone broth variety bundle including 6 cartons – 2 cartons of each broth type – costs $47.94 with one-time purchases and $41.71 with a subscription. With soup variety bundles, you can opt for the 3-carton bundle, which costs $29.97 with one-time purchases and $26.07 with a subscription, the 6-carton bundle, which costs $59.94 with one-time purchases and $47.95 with a subscription, and the 12-carton bundle, which costs $107.88 with one time purchases and $90 with a subscription. For all orders including 6 or more cartons, shipping is free of charge, except if you are ordering from Alaska, Hawaii or US territories, in which case you pay a $35 shipping fee per delivery. No matter where in the US you live, Kettle And Fire Bone Broth products can be delivered straight to your doorstep. Unlike many other meal delivery services, Kettle And Fire Bone Broth does not only deliver throughout the continental US but also ships its products to Hawaii and Alaska, US territories, and APO, DPO, and FPO addresses. Delivery time depends on your location, but you can expect your broths and soups to arrive within 1 to 5 days. If you are not satisfied with your delivery for whatever reason, you can request a refund within 30 days of your purchase date. To make sure Kettle And Fire Bone Broth meets all your standards and expectations, it is important to know its biggest advantages and disadvantages. With a short overview of its pros and cons, you can easily decide if Kettle And Fire Bone Broth is the right company for you. Concluding this Kettle And Fire Bone Broth review, we can only state that this service proved to be even better than we expected. The menu may not be varied, but that is a part of its charm. Every recipe is carefully designed and every soup and bone broth is simmered for a whole day, so you get to enjoy food that is prepared with a whole lot of love and care, which makes Kettle And Fire Bone Broth products even more special. All soups and broths are incredibly healthy and suitable for a vast range of broth lovers. 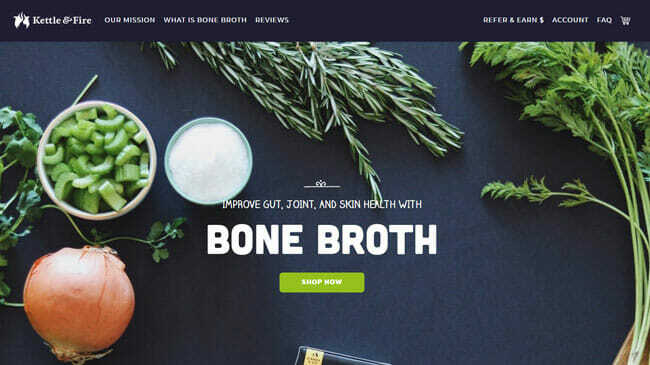 Plus, the prices are reasonable and there are plenty of ways to save cash on your orders, so if you are a fan of bone broth, Kettle And Fire Bone Broth is a service you do not want to miss. Our ratings are the result of an objective and independent evaluation of Kettle And Fire Bone Broth, generating the final rating that reflects the overall quality of the company. Ratings may change as the service changes. Kettle And Fire Bone Broth customer rating based on 3 customer reviews. Incredible broths, I drink them in the evening, use them for sauces and stews, they make everything taste better. Excellent quality and taste but the prices are high for bone broth - it's just bones and veg, even if they are organic, it should cost way less. We found 1 verified Kettle And Fire Bone Broth discount for April, 2019. Sign up and we’ll let you know about future Kettle And Fire Bone Broth promo codes.